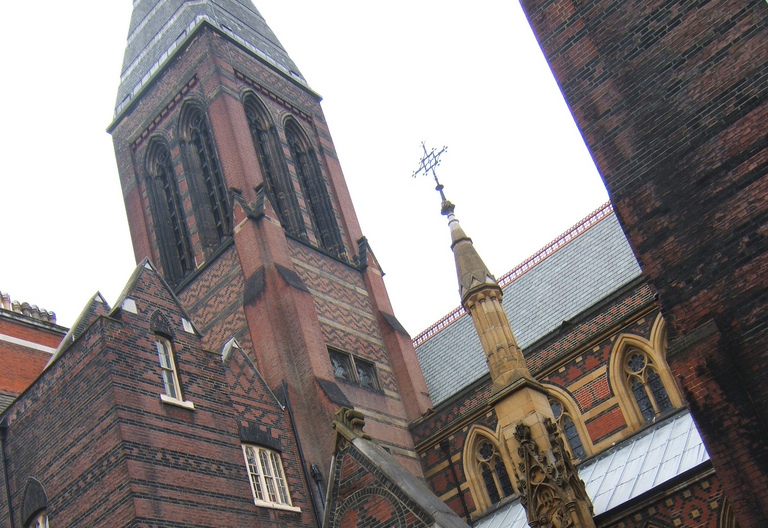 The high Victorian Gothic style of All Saints in Margaret Street. The Grade I listed building will be open as part of Open House London 2013 over the weekend of 21 and 22 September. Open House -- "the capital’s greatest architectural showcase" -- will be a unique opportunity to see, explore and learn about architecture and design in London over the weekend of 21 and 22 September 2013. More than 800 buildings will be open, there's a programme of neighbourhood walks, engineering and landscape tours, cycle rides and experts’ talks – all for free. Virginia Woolf in Bloomsbury. Fitzroy Square. A guided walk of the squares associated with Virginia Woolf and the Bloomsbury Group. Details. All Souls Church of England Primary School. Foley Street. Details. All Saints Church. Margaret Street. Grade I listed high Victorian Gothic style church. Details. Government Art Collection. Queens Yard. Guided tour of premises and behind-the-scenes look at how this major collection of British art operates. Details. Gibbs Building, Wellcome Trust. Euston Road. HQ of the Wellcome Trust – a global charitable foundation. Details. UCH Macmillan Cancer Centre. Huntley Street. Details. Camden Local Studies and Archives Centre. Theobalds Road. Archives recording 5 centuries of the history of one of London’s most historic areas embracing Holborn, Bloomsbury, Fitzrovia, Camden Town, St Pancras, Hampstead and Highgate. Details. Fitzrovia Neighbourhood Association. Tottenham Street. Not officially part of Open House London, but the ground floor of the Grade II listed Georgian building will be open from 10 am to 4pm on Saturday 21 September with an exhibition of photographs and a browse and buy book stall. Details.